Yes I am that mom who snaps a photo before getting her kid down :P The baby gate was blocking the entrance to the stairs, so he just found another way up! I couldn’t help but laugh. Little Man is so much like his daddy; if it doesn’t work one way, he will find a solution! Thanks for stopping by my blog and sending prayers. Praying for a speedy and easy labor for you…and soon! haha I’m all about the “potential learning experiences” but he could have easily climbed to the top, and he would have too had I not gotten him down! sigh. he’s such a climber! haha glad I’m not the only one! it’s so hard not to laugh sometimes!!!! Thanks for hosting the link up!!! 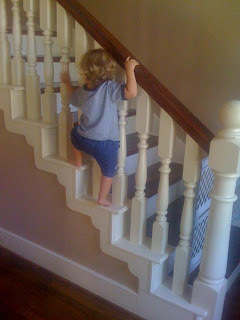 Hey Buddy!, I found this information for you: "Confessions of an imperfect mother part 10 – stairs". Here is the website link: https://www.beautythroughimperfection.com/confessions-of-an-imperfect-mother-part-10-stairs/. Thank you.